It’s Halloween, the one time of the year the Gargoyles can be seen in public, especially with their existence public and the hot costume in New York City. Xanatos is throwing a party as part of his plan to make the Gargoyles accepted while the Quarrymen plan to show up without hammers but still making a statement and the NYPD setting up a gargoyle task force, with the Illuminati working all sides. Meanwhile, Elisa is convinced to separate with Goliath as a romantic couple. Goliath and Brooklyn later journey to the Catacombs to check on the mutates and clones. Brooklyn attempts to ask Delilah as his date for the masque but Goliath beats him to it. When they leave the Catacombs have another visitor, only this time it’s Thailog! What they got right: It’s good to see Xanatos and Matt in their own ways working to help the Gargoyles. We get to see Weisman’s intentions for the mutates and clones. And the mystery of what the Illuminati is actually planning should be interesting. What they got wrong: Someone in the comments for last issue’s review stated that Weisman regretted putting Brooklyn through the romantic ringer. He is the Gargoyle who most wanted a mate. First he gets blocked by Broadway in the show, the one who used to be least interested in romance, and now the only other single female among his kind gets taken by Goliath, rather than pursing the Goliath/Elisa romance which I’m also disappointed about. As someone who also wants a wife and kids both when the comic came out and now that it appears to be less and less likely as I get older joined by my recent medical and financial woes, I wish he had that opinion sooner. Like this issue sooner. I’ve heard he did fix this later on but by then I had lost interest mostly for that reason and the story is only available in the trades, like the end of the Bad Guys miniseries or Devil’s Due Voltron run. Please stop doing that. Some of us prefer the single issues for various reasons and prefer to keep our graphic novels with original stories. Recommendation: This feels more like Gargoyles than the Marvel run and at least my problems with the story are personal preference more than anything else. It’s worth checking out, especially if you’re a fan of the show. 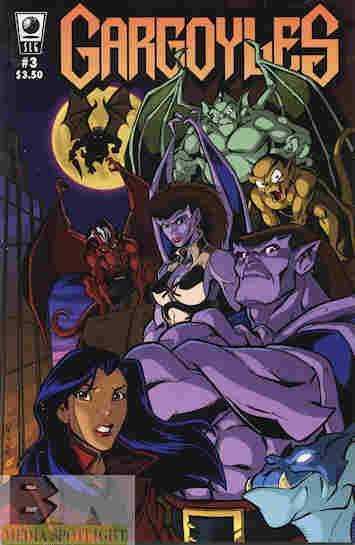 Posted by ShadowWing Tronix on April 11, 2018 in Animation Spotlight, Television Spotlight, Yesterday's Comics and tagged Brooklyn (Gargoyles), Elisa Maza, Gargoyles, Goliath (Gargoyles), New York City.